The overall outlook for Africa’s development has improved, largely due to recent growth as recorded in GDP growth (average over 4% per annum across the continent) over the last decade. A recent report by Mckinsey and Company (2014) highlighted that Africa’s collective GDP in 2008 was 1.6 trillion, roughly equal to Brazil or Russia’s. The report provides further evidence of Africa’s growing business environment, with at least 20 African companies with revenues of at least US$ three billion and a fast growing ICT sector, with 316 million new mobile subscribers. The British Council reported ‘five of the world’s top ten countries in GDP growth are in the region, with foreign direct investment up, inflation slowed and remittances at record levels’. As such, Africa is currently facing a number of emerging challenges that might also be seen as opportunities, including a rising middle class, rapid urbanization, strong ICT growth and a high proportion of youth. Despite this growth, agricultural production and productivity remains low and focuses on subsistence. Agriculture is implemented primarily by smallholder rural farmers, who continue to face traditional challenges of rain-fed agriculture, poor postharvest management, low value addition and low productivity. Efforts to strengthen on and off farm agricultural production and value addition requires a cadre of skilled workers and facilitators to support access to available knowledge for enhancing production and marketing. 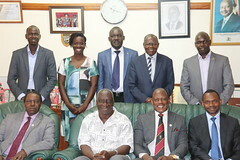 While universities have been a strong focus of many programs that support the building of skills to support the provision of agricultural advisory services in Africa, less focus has been provided to Technical and Vocational Education and Training (TVET) institutions along the educational value chain, which have the capacity to scale knowledge generation, access and use. The university sector in Africa has grown from just under 70,000 students in the late 1970’s to over six million in 2012. Universities are mushrooming all over the continent, yet demand continues to grow. However, growth has been at the expense of TVET institutions in Africa. This is because many new universities have been created by the transformation of TVET institutions, by making use of their existing infrastructure. Equally, budget allocation to the university sector has continued to grow, in most countries it has decreased for TVET institutions. Nonetheless, TVET institutions have an important role to play in putting in place the necessary skills, at scale, to support farmers and other stakeholders in driving production and development. Increasing collaboration and mutual learning among institutions and agencies implementing and influencing innovative Tertiary Agricultural Education for rural transformation in Africa. Through this project, the delivery of transformative services to ensure production of entrepreneurial graduates with leadership skills and potential to create impact in the rural communities will be supported. One of the sub-components of this project relates to integration of TVET into the Community Action Research Program (CARP) as a mechanism to enhance educational value chain and linkages between universities and TVET institutions as well as increase the impact and contribution of higher education institutions to rural development and transformation. As can be seen, Objective 2, 3 and 4 require that the Project clarify how the engagement between the universities who are the key implementers, with RUFORUM coordination, will work to engage with TVET institutions initially in Kenya and Uganda, but later across the continent. Thus, RUFORUM is commissioning a scoping study to provide an underpinning for the work to be undertaken and provide a clear and coherent mechanism for university engagement in TVET and with TVET institutions. In order to provide the framework for implementation of the TAGDev project and to inform the strategy for implementing components that require university/TVET engagement, the objective of the scoping study is to gain a better understanding of the TVET Sector in Africa and more specifically within Kenya and Uganda and to provide recommendations to inform the development of a coherent mechanism(s) for university engagement in TVET and with TVET institutions, building on the current TAGDev and RUFORUM framework, particularly the community action research program and the Master’s programs in agribusiness and entrepreneurship at Gulu and Egerton Universities, which are of focus in the current project. Provide recommendations on the possible role of universities in strengthening TVET institutions in Uganda and Kenya and specifically in support of the TAGDev program and RUFORUM agenda in its member countries. Inception report detailing approach for the study, plan of action with detailed framework of activities, methodology to be applied, proposed content outline for the report, schedule and any logistical propositions. Final scoping study report, including an executive summary and recommendations for the TAGDev Project. This assignment is expected to be undertaken over a period of 30 man days and expected to spread over a period of three (3) months starting 23 February 2017. Applications and expressions of interest should be submitted not later than 16 February, 2017 (17:00 EAT). This is an open competitive request for consultancy services. Individuals and/or firms interested should submit their technical and financial proposals stating the assignment applied for, along with an application letter outlining knowledge, competencies, skills and past experience in undertaking the tasks specified in the above. The applicant should essentially be a senior researcher with technical capacity in undertaking scoping studies as well as strategy design and development. The technical proposal should provide relevant details to the assignment’s focus, including the methodology/approach to be used in each task, as well as the timing and/or scheduling for each task. The financial proposal should indicate how much the entire assignment will cost in terms of professional fees and reimbursable costs and transport costs. The applicant should attach at least two copies of the most recent assignment reports executed elsewhere. A detailed Curriculum Vitae of the lead applicant and/or team composition proposed for the assignment will be required and will be part of the evaluation. The applications will be evaluated on the basis of 70% technical quality and 30% financial soundness of the application. All applications shall be submitted by email to: secretariat@ruforum.org not later than 16 February, 2017 (17:00 EAT).